Neko Atsume – Call me the crazy cat app lady | Living life in the carpool lane.. In: Phone apps | Review.. for YOU! 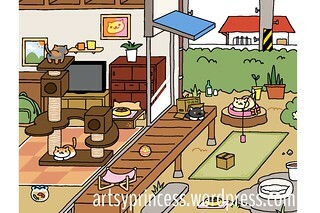 Do you know about Neko Atsume: Kitty Collector? One of my friends downloaded it on her phone and told a group of us about how addicting this game truly is. I’m always a sucker for a new app/game, so I downloaded. Now you can call me the crazy cat app lady. The premise of the game is simple. Create a yard interesting enough for cats to hang out in. These cats visit your yard and leave you fish. They can either give silver or gold fish. Those fish are currency. Those fish are what you use to purchase new toys and furniture to entice more cats to visit. And it just cycles on and on from there. I recently earned enough gold fish to purchase the yard expansion which allowed me to get the inside of the house. It truly was a happy day. It’s also a very low maintenance game. The cats only come when you leave the app. You have to make sure that there is enough food for the cats to visit. And when you pop back into the app, there could be cats there just hanging out. You can also have rewards waiting for you, which are their gifts of fish. Did I mention that these cats are all so super cute?! It’s also a great way for M to play with cats and not have an allergic reaction. Tell me what kind of game apps do you play with? If it’s interesting enough, I’ll try it out and review it here too!